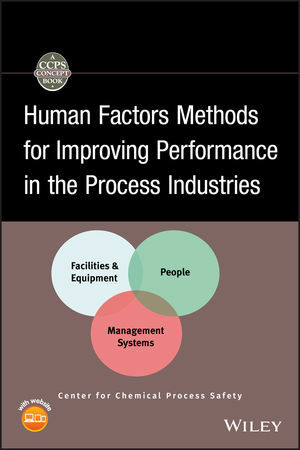 Human Factors Methods for Improving Performance in the Process Industries provides guidance for managers and plant engineering staff on specific, practical techniques and tools for addressing forty different human factors issues impacting process safety. Human factors incidents can result in injury and death, damage to the environment, fines, and business losses due to ruined batches, off-spec products, unplanned shutdowns, and other adverse effects. Prevention of these incidents increases productivity and profits. Since 1985, the Center for Chemical Process Safety (CCPS) has been the world leader in providing information on process safety management and technology. CCPS, an industry technology alliance of the American Institute of Chemical Engineers (AIChE), has published over eighty books in its process safety guidelines and process safety concepts series. In this book, CCPS teams up with the AIChE Safety and Health Division. Members of the CCPS Human Factors Subcommittee contributed chapters or sections in their areas of expertise. For more information, visit www.ccpsonline.org. 1.1 Purpose of This Book. 1.4 Structure of This Book. 1.5 Linkage to Other CCPS Publications. 2 The Case for Human Factors. 2.1 Why is Human Factors Needed? 2.4 Human Factors in the Life Cycle of a Chemical Plant. 3 Performance Measurement and Improvements. 3.1 Building Improvements into Existing Systems. 8 Facilities and Workstation Design. 9.2 Human Interactions with Control System Software. 12.2 Guidelines for Training Programs. 12.3 Guidelines for Designing and Delivering Training. 14 Documentation Design and Use. 14.2 Converting to Electronic Documentation. 15.4 Temperature and Relative Humidity. 16 Workloads and Staffing Levels. 18.2 Manual Materials Handling Guidelines. 19.2 What is Safety Culture? 19.4 Safety Culture: A Process Industry Case Study. 21 Project Planning, Design, and Execution. 21.2 Human Factors Tools for Project Management. 23.2 Identifying Critical Maintenance Tasks. 24 Safe Work Practices and Permit-to-Work Systems. 28.2 People and Safety Systems. 28.3 Bypassing and Disabling Safety Systems. 28.5 Selection of Safety Systems. 28.6 Common Cause Failures in Safety Systems. 29.2 Elements of Competence Management. 30 Emergency Preparedness and Response.